Julian Castro was born in San Antonio, Texas, on September 16, 1974, along with his twin brother, Joaquin Castro. Their mother, Maria Castro, helped create the radical Chicano movement La Raza Unida (LRU) in 1970, and in ’71 she ran an unsuccessful campaign (on the LRU ticket) for the San Antonio City Council. She was a strong ideological influence on her sons, as evidenced by the fact that both boys were lauded as “modelos” (young people worthy of emulation) at an Activist Reunion which former LRU members held in December 1989. In 2001 Castro launched a political career by winning a seat on the San Antonio City Council. In 2005, he co-chaired the Mayor’s Task Force on Hunger and Homelessness, which produced a ten-year plan designed to end chronic homelessness in San Antonio. This plan called for massive public expenditures to fund: (a) the creation of 800 new permanent housing units for people with disabilities; (b) increased access to public restroom facilities; (c) increased enrollment in the food stamp program; and (d) the expansion of the San Antonio Food Bank’s storage facility. On March 29, 2010 in San Antonio, Castro and his brother both attended a gala event commemorating Rev. Claude Black, a local Communist Party USA sympathizer who had died a few days earlier at the age of 93. In July 2012 as well, President Barack Obama selected Castro to deliver the keynote address at the upcoming Democratic National Convention in Charlotte, North Carolina. In his speech, Castro tried to emphasize his Mexican heritage by saying three times, “Que dios los bendiga” (Spanish for “God bless you”), and explaining that his grandmother used to say those words to him and his twin brother as they left for school each morning when they were children. In March 2013, Castro and his brother both joined Jeremy Bird at the first grassroots meeting of Battleground Texas, an organization dedicated to transforming the traditionally Republican state of Texas into a permanent Democratic stronghold. In the 2016 election cycle, Castro was a strong supporter of Hillary Clinton‘s presidential bid. 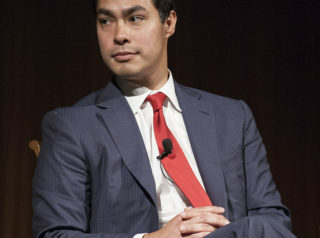 Julian Castro’s brother, Joaquin, is a Democratic U.S. Congressman from Texas. Further Reading: “Julian Castro” (Biography.com, Votesmart.org, Ballotpedia.org, Keywiki.org); “Julian Castro ‘Doesn’t Really Speak Spanish’” (Daily Caller, 9-5-2012); “Rent to Criminals — Or Else” (by Matthew Vadum, FrontPageMag.com, 4-7-2016); “Julian Castro Cites 90 Percent Tax on Rich in Defending Alexandria Ocasio-Cortez on Tax Hikes” (Washington Examiner, 1-16-2019); “Julian Castro: America Should Address the Original Sin of Slavery Including Potential Reparations” (by Pam Key, 3-10-2019).